Blue Sky Guttering Ltd clean all types of commercial guttering in Birmingham. Gutter cleaning services for your, school, shop, businesses, offices, industrial unit, hotel, hospital, apartment and much much more. With our 25 years of working at height experience and ongoing training, all our clients in Birmingham can have complete peace of mind when choosing Blue Sky Guttering Ltd.
Blue Sky Guttering repair commercial gutters throughout Birmingham. Our team are trained to the highest professional standard and all our commercial gutter repair services are always carried out efficiently and professionally. We ensure that all our health and safety procedures are in place. Plygene Gutterline® is the only BBA approved system to stop gutters leaking, for good. Plygene Gutterline® can be used on all sizes and types of commercial buildings, on all kinds of commercial roof and for any gutter profile. Because Gutterline® is made to measure for every project, a perfect fit is guaranteed and it stops commercial gutters leaking, for good. Manual asbestos roof cleaning is needed when the asbestos roof surface is heavily contaminated with moss and other weed growth. We coat the asbestos roof to provide a permanent coating that seals the surface, prevents moss and lichen growth and repels water. Metal roof cleaning is needed when the metal roof surface is heavily contaminated with moss and other weed growth. sing a revolutionary new glaze protect product from Asbestoseal we offer a cost effective roof light repairs service. Blue Sky offer roof light replacement should repair not be suitable or if required from the customer. Blue Sky are experienced, trained and qualified Safety Line & Safety Eyebolt testers and test eyebolts and safety lines throughout Birmingham and the UK. Safety is paramount to our business which is why we are ISO 9001 2008 certified, members of IOSH, Safecontractor and Constructionline accredited and approved. From a small commercial unit to a large multinational company, we will ensure very competitive pricing and the very highest cleaning standards throughout Birmingham & West Midlands in the South East and Home counties. As members of IOSH, Institution of Occupational Safety and Health and Safe Contractor approved, we have an ongoing Health and Safety training program and audits are regularly carried out. We are fully IPAF trained, experienced and licensed to use powered access equipment. Many architects and builders now specify Gutterline on new-build projects as an added insurance against joint failure on their gutters. Save time and money and fit Plygene Gutterline® now. 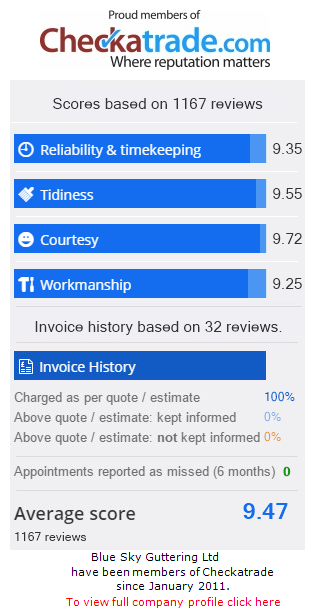 Checkatrade supply you with up-to-date informationon trades and service providers, helping you make informed decisions on whom you employ.